This page carries brief details of related Musical Fidelity products that are related to the A1. You'll note that the information here relates very much to Musical Fidelity's earlier products; if anyone is able to offer information on their later products, I'd be fascinated to hear from you. I'm keen to see what configurations they are using today, especially knowing how well-reviewed their products currently are. Thanks to Marc Huske for supplying the following pictures of a "David" and a "David II". As far as I can establish, this was a tuned version of the A1 that sold to the German market. The pictures here show the original version of the A1 circuitry. From the front, there is a "David" logo in place of the "A1" designation. Inside, things look normal at a glance, but you can just see two large black polypropylene capacitors hanging off the right-hand end of the PCB which appear to be connected in parallel with the main smoothing capacitors. 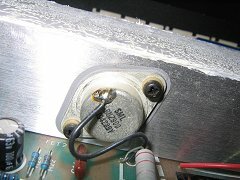 Also, there are bigger loudspeaker binding posts and an IEC mains inlet instead of the captive two-core lead - the case of this unit is connected to mains earth. This mains transformer looks like it might have 4 primary wires, meaning that it could probably be converted to 120VAC operation - most examples I have seen, including my own, have just 2 primary connections, meaning a new mains transformer would be required for 120V operation. The quad op-amps in both the phono preamp and the main line preamp are in sockets, but apparently they are still the standard TL084s. Looking at the PCB, it says David II on the silkscreen, between the input sockets and the power supply. From a recent examination of a MK3 A1, it's clear that the PCB is MF's latest version. The line preamp has moved slightly, and has an extra 4 transistors to implement a simple power-on mute. Here, Marc has upgraded the TL084 to an OPA4134. 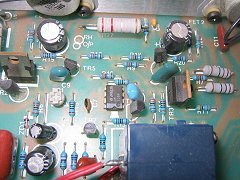 The 1uF input capacitors on the power amplifier have been changed for polyester units (like I did when I replaced my preamp). The phono preamp is slightly different - they've dropped the complicated regulation arrangement that the original version had, and there is a pair of TO92 voltage regulators supplying the dual op-amp instead. Many thanks to Marcus Ackel for these pictures of his Final Edition. As you can see, this is the B200 circuit, with an outboard power supply that gives higher supply rails and a higher output - 40 watts per channel. The first image shows the general view with the cover removed - click these images for a larger view. The "Final Edition" sticker can be clearly seen on the PCB. The connection from the outboard PSU appears to be a 3-pin XLR - raw AC from the external transformer is switched by the power switch, meaning that the transformer is continuously powered when it is plugged into the mains supply. Looking at the enlarged version of the picture showing the underside of the PCB, you can clearly read "B200 MK2 ISS 4" towards the bottom-right of the image. Released in 1986, the A100 is a beefed up A1 in a slightly taller case producing 50 watts per channel. To achieve this, there's a bigger transformer giving higher supply rails. Musical Fidelity claim that it operates in class A 99% of the time, but I suspect that this refers to the time spent outside of class A operation in typical use with music rather than test tones; in other words, we almost certainly can't infer anything about the standing current from that statement! 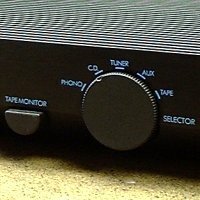 Something that amuses me - reviews often state that the phono stage was much-improved compared to the A1, but it's exactly the same! 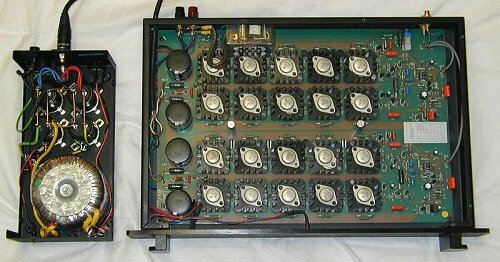 This is a monoblock amplifier built into an A1 case, released in 1985. It's just an A1 with a bigger power supply - the PCB is the same, just the components relating to the pre-amp aren't fitted. 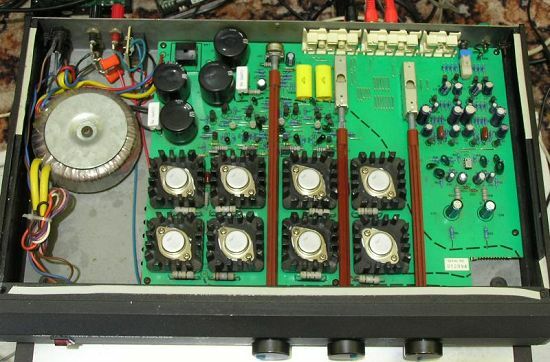 Both power amp sections are fitted, and the outputs are wired in parallel. Apparently they are even less reliable than the A1! These all use Musical Fidelity's "op-amp plus MOS-FETs" power stage - another Tim de Paravincini design. This includes the P140 (70Wpc), P170 (85Wpc), P180 (80Wpc), P270 (135Wpc), P370 (185Wpc) and the B200 - no-doubt there are others too. The design was gradually refined over the years, but follows the basic topology explained on the Technical Page. This is a picture of the insides of a P180 - you can see the multiple output MOS-FETs all on their individual heat sinks. Somehow, they don't seem big enough for an 80W amplifier but at least there will be a saving in thermal resistance because the devices won't need to in electrically insulated from the heatsink. 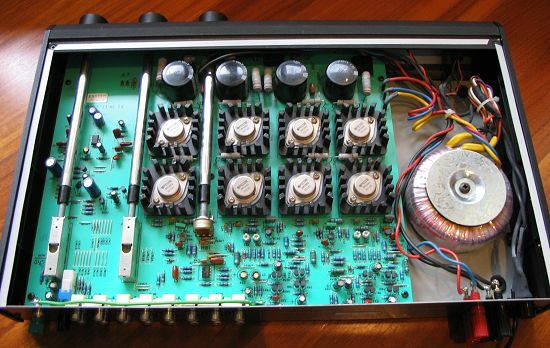 The outboard PSU appears to have an XLR connection to the umbilical lead that connects to the main amplifier. I don't recall where this image came from, so if you recognise it, please let me know and according to your wishes I'll either credit you, or remove the image. 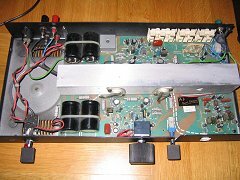 This was Musical Fidelity's budget model at the time of the A1, and I remember considering this when I purchased my A1. Compared to the A1, it's positively awash with facilities despite the lower cost (£199 IIRC), including a record-out selector and a headphone socket - although rather annoyingly, this is on the rear panel! The power output was quoted as 32 watts per channel. Cost cutting was evident - for example, the extension rods for the selector switches were plastic rather than metal, and felt rather cheap as a result. The case is thin steel and plastic mouldings, and lacks the appeal of the A1. Thanks to Kat Manton for this picture of the B1. Technically, it's another quirky design. The output stage consists of four 2N3055s per channel, mounted on individual heatsinks that are directly on the PCB. In terms of topology, it has much in common with the A1, with dual long-tail pairs and dual feedback paths. The line preamp is simpler (but better) that the A1, using a single op-amp per channel providing gain after a conventional volume potentiometer. And the phono preamp is similar, using a transistor gain stage ahead of an op-amp using shunt feedback. This version appears to be more complicated than the A1 version, having complimentary transistors and heavy supply filtering of both rails. There is an MC option, and it's implemented in the same way (changing the emitter impedance of the input transistors). First, it can be found on the excellent Hi-Fi Engine website. You have to join up, but this is free, and well worth the effort. 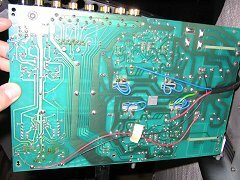 Secondly, this amplifier was discussed on the UK Vintage Radio Repair and Restoration forum, where I contributed a fair bit to the discussion. If you need to learn more about how it works, it's worth studying the thread - there's no sense duplicating it here, but I have saved the text of the discussion locally should that thread be removed in the future. I don't know what electrical changes happened with the move to the Mark II - it might have little more than just been a PCB revision - but you can tell them apart from the position of the knobs on the front panel. Compared to the earlier example pictured above, the three rotary controls have moved across to the right, so only one of the extension shafts travels between the heat sinks. You'll note two other changes for this version: first, the ridiculously-placed headphone socket has been deleted; secondly, the extension shafts have been upgraded to what looks like metal. The volume potentiometer has been moved forward so that all three shafts can be the same length. The power transistors have moved back to make space for the power supply just behind the front panel. From other close-up pictures that I have seen, the op-amps are now the TL072, and the output transistors are 2N5882.